From left to right: Claire, Dan, Heather and Ed. While most of the DPR Group Team takes the week between Christmas and New Year’s off to spend time with their family and loved ones, a few of us stay in the office to keep the ball rolling. 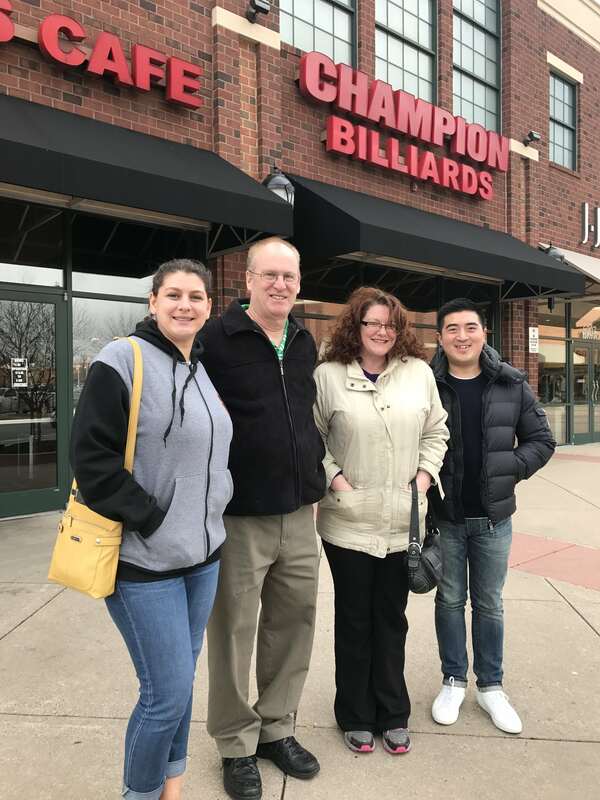 As one of our traditions, on the last Friday of the year, company President Dan Demaree takes those of us who are in the office out to play pool and have lunch at Champion Billiards Sports Café, which is just down the road from our office. It comes as no surprise that Dan, a 12-year seasoned amateur poolplayer in the American Poolplayers Association (APA) who has captained his team to qualify for the APA National Team Championships in Las Vegas five times and qualified individually for the APA National Singles Championships once, puts up quite the challenge every year. This year was no different. To even the odds, Dan went up against a three-person team of Heather, Claire and Ed – let’s call them “the Hustlers.” The Hustlers played several rounds of 8-ball against Dan. And while Dan proved to be a formidable opponent as expected, the Hustlers managed to win a few matches thanks to team captain Claire (and a handicap where each player got one shot for every one of Dan’s). 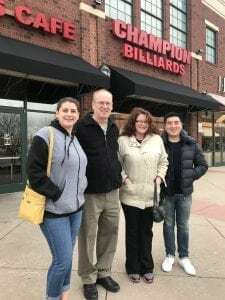 We capped off our annual outing with a free-for-all round of 9-ball, delicious crab cake platters and a photo to commemorate the occasion. The Hustlers will have to wait for their rematch. But until then, the DPR Group Team would like to wish everyone a wonderful and successful New Year ahead!